There's already been a death. New World, Amazon’s upcoming MMO, started the year with a Choose Your Own Adventure on Twitter. Someone on the social media team watched Bandersnatch over the holidays. And like Netflix’s recent experiment with interactive fiction, the adventure has taken a grim turn. Twitter has already killed off one character. The journey began on January 3, and by January 11 it had been cut short by a screeching zombie. It turns out, as Twitter learned too late, that wooden swords make awful weapons. Not surprisingly, 80 percent voted to charge into battle instead of running away to get help. It’s OK, however, because death has just sent the bruised and battered hero back to the campfire. 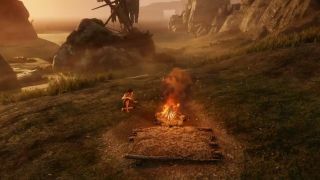 Nothing’s happened yet, but it looks like Twitter is digging its heels in and once again refusing to find other adventurers in this multiplayer survival game. Voting isn’t over yet, but striking out alone is in the lead. The tweets are accompanied by short videos giving us a very brief look at the world, or at least a beach, and combat. One suggests that there’s a stealth system and that enemies are attracted by noise, but it might just be flavour. If there’s something specific you want to see, you’ll need to vote. Along with the pesky zombie, more of New World's creatures have been shown off, including the Guardian below. Guardians are elemental beasties that come in various shapes, and this one's obviously a nature Guardian. Very mossy. Here's a frosty version. Last month, we got also to see a bit of New World’s crafting and fortress construction, and there are plenty more screenshots on the Twitter account. It's still in alpha, but you can sign up to join here.